On the Dakota prairie, the muskrats build their thick-walled houses and the geese fly south with great haste, not even stopping to rest in the Big Slough. Pa Ingalls watches these signs and worries of what they foretell. 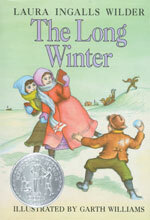 The Long Winter by Laura Ingalls Wilder continues the saga of the Ingalls family–pioneers who moved west until they finally settled in the new town of De Smet in Dakota Territory. A surprise October blizzard leaves Pa fearful for his family’s safety as their claim shanty is in no condition to withstand the seven months of storms a wise Indian warns them of. Pa moves Ma, Mary, Laura, Carrie and Grace into the store building in town so they can be snug and warm, and close to supplies. But the constant blizzards, sometimes only a day or two apart, keep the trains from reaching De Smet. There is no coal, no kerosene, no flour, and no game to hunt. The men go to work on sunny days with picks and shovels, trying to clear the Tracy cut so that the trains can get through to the townspeople who are slowly wasting away. Then the word comes–no trains until spring, and the people of De Smet wonder how long they can survive. The days are filled with chores and lessons. Ma, Mary, Laura, and Carrie take turns grinding seed wheat in the coffee mill while Pa hauls hay from the claim. Pa and Laura, and sometimes even Ma and Mary twist hay to feed the fire. They eat only two meals a day and go to bed early to save hay and food. Laura notices how pale Carrie looks these days. The store shelves are empty and there are no wages because there has been no work since the trains shut down. 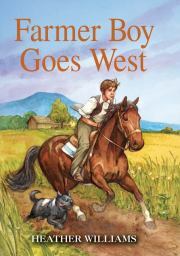 Cap Garland and Almanzo Wilder, who runs the feed store with his older brother Royal, set off on an early clear morning to find a farmer south of town who might have seed wheat to sell. It is a cold, long trip as their horses and sleds fall into deep snow drifts and have to be dug out. They run alongside their sleds, stamping their feet and slapping their hands against their frozen bodies to prevent frostbite. They hustle to pack sixty bushels of seed wheat onto their sleds and make it back to town before the next storm. They spy a blizzard cloud in the northwest, blotting out stars one by one. They push their tired horses faster while the townspeople of De Smet worry over Cap’s and Almanzo’s fate, and the wheat that might keep them from starvation. The reason I am drawn to this book is because of its wonderful descriptions. Wilder paints a clear picture of what it was like to live in Dakota Territory during what it usually referred to as the Hard Winter. From the hunger, to the frost covered nails on the roof of her house, to the piercing screams of the constant blizzards, Wilder pulls me in. I feel the pain Laura experiences as she watches her family suffer through the dangers of living in a new town where not even rabbits can be hunted for food. I admire Almanzo and Cap as they risk their lives to save the townspeople. And I join in the excitement of waiting for that first train to arrive after months of no supplies. 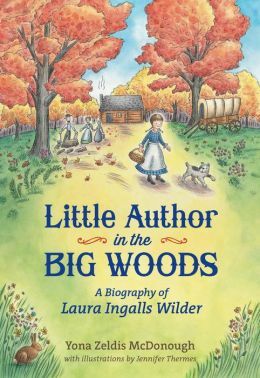 A book of courage against seemingly insurmountable odds makes The Long Winter a must read for all Laura Ingalls Wilder fans.